Robert Spear Hudson (1812-1884) was the man who first popularised soap powder, working from his modest shop in West Bromwich. He eventually moved his business to a factory in Bank Hall, Liverpool, and went to live in Chester. His son Robert William Hudson (1856-1937) became extremely wealthy and sold the business to Lever Brothers in 1908. He commissioned the distinguished local architect Edward Ould to build a Black-and-White Revival house in 1891 on a site near Bidston Hill on the Wirral. It bears more than a passing resemblance to Little Moreton Hall, near Macclesfield – but built in reverse. It was named Bidston Grange. 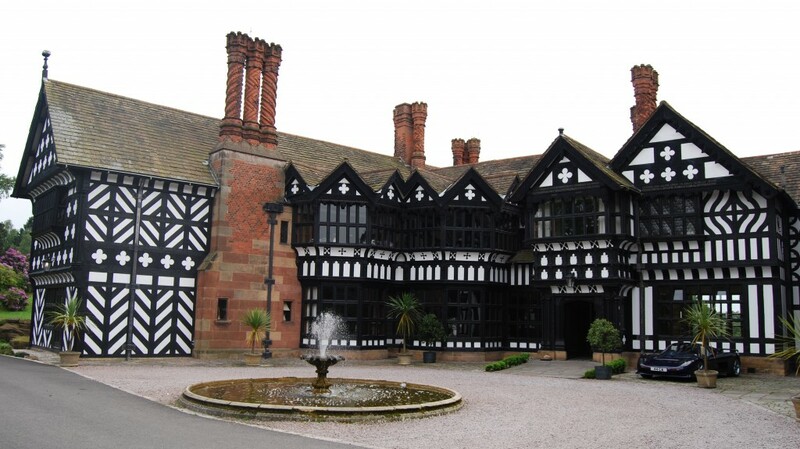 Typically of its time and its style, Bidston Grange contained sumptuous glass by William Morris, and architectural bric-a-brac with antique associations – dining-room doors from a tea-clipper and a fireplace dated 1577 reputedly from “Sir Walter Raleigh’s former home”. It was apparently the model, or at least the inspiration, for Cecelianhof, the Potsdam residence of the Crown Prince Wilhelm, son of Kaiser Wilhelm II, built c1911 and subsequently the site of the signing of the Potsdam Agreement of 1945. In 1921 Bidston Court was sold to Sir Ernest Royden (1873-1960), one of a dynasty of shipbuilders and shipowners. Because Lady Royden disliked the way its setting was encroached by housing [http://www.geograph.org.uk/photo/218605] the 1891 structure was dismantled and re-erected a property she had inherited five miles away at Frankby. There it replaced a house of 1868-70, originally built for Septimus Ledward JP, which took its name ‘Hillbark’ from a stone barn that had stood for several centuries. The Roydens’ transplanted residence became known as Hill Bark. The original site at Vyner Road South, Bidston, is now a public garden. When Sir Ernest Royden died in 1960, Hill Bark was purchased by Hoylake Urban District Council and converted into a residential home for the elderly. It was sold in 1999 for £300,000 and converted first into a catering-facility specialising in weddings, opened in 2000, but using only the ground-floor rooms. In 2002 it was restored as a luxurious 19-bedroom five-star boutique hotel: http://www.hillbarkhotel.co.uk. 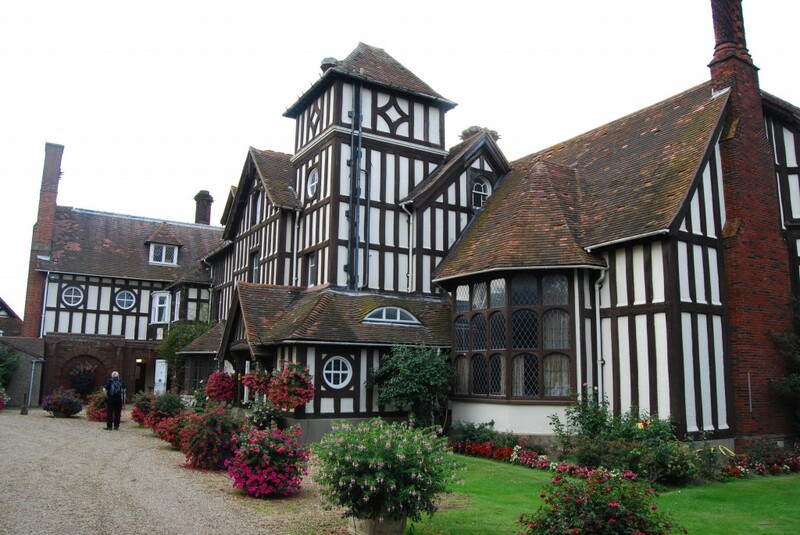 This entry was posted in Black-and-white architecture ancient and modern, Country Houses, Life-enhancing experiences, Survivals & Revivals: past views of English architecture, Victorian Architecture on June 24, 2015 by Mike Higginbottom. One of the most distinctive places to stay on the Wirral is Leasowe Castle, which was in fact never a castle, though it has been put to many uses in its four-hundred-year history. Leasowe Castle is identified with the “New Hall” built by Ferdinando, 5th Earl of Derby in 1593, the year of his accession to his title, possibly as a stand from which to watch horse-racing on the flat shore. A datestone bearing the Stanleys’ triskelion, the three-legged symbol of the Manx kingdom, is now in the Williamson Museum & Art Gallery in Birkenhead. Ferdinando, Earl of Derby’s original structure was an octagonal tower with walls three feet thick, to which were later added four square towers, possibly by William, 6th Earl, in the early seventeenth century. By the late seventeenth century the building was derelict and known locally as “Mockbeggar Hall” and for much of the eighteenth century it was used as a farmhouse. In 1802 was sold to Margaret Boole, “the kind old lady of Leasowe Castle”, which she had made a refuge for the victims of shipwrecks and wreckers on the Wirral coast. She set up Dannet’s Rocket Apparatus on the shore in an attempt to prevent shipwrecks and the pernicious activities of the local wreckers, who would show false lights in an attempt to lure vessels ashore. Margaret Boole died in 1826 as a result of a carriage accident, and the Castle passed to her daughter and heir, Mary Anne, the wife of Col Edward Cust. Colonel Cust converted the Castle to a hotel with the intention of establishing a resort in the grounds, and when this ambitious project failed in 1843 he turned back it into a residence which he kept until his death. – and possibly the oak Canute’s Chair, now lost, which stood above the high-water line, carved with the motto “Sea come not hither nor wet the sole of my foot”. One of Col Edward Cust’s successors sold the Castle in 1891 to the Leasowe Castle Hotel company. The original Star Chamber panels are reported to have been sold in the contents sale which took place on September 16th-20th 1895: the existing ones may be reproductions. In 1910 the Castle was bought by the Trustees of the Railway Convalescent Home and, apart from an interlude during the First World War when it housed German prisoners of war, it remained in their hands until 1970. In 1982 it returned to hotel use: http://www.leasowecastle.com. This entry was posted in Black-and-white architecture ancient and modern, Country Houses, Life-enhancing experiences on June 19, 2015 by Mike Higginbottom. Sir Edgar Speyer (1862-1932), was an exceptionally rich and exceptionally cultured man. He came from a German Jewish family that ran finance houses in Germany, Great Britain and the United States and he took British nationality in 1892. As such, he organised much of the capital that enabled the Chicago transit tycoon Charles Tyson Yerkes to establish the deep-level underground railways that became London’s Bakerloo, Northern and Piccadilly lines. After Yerkes’ death in 1905 Edgar Speyer became chairman of Underground Electric Railways of London. He used his wealth to further his enthusiasms, funding Henry Wood’s Promenade Concerts from 1902 to 1914, the Whitechapel Art Gallery (1901) and Robert Falcon Scott’s ill-fated 1910-12 Antarctic Expedition. He was one of the millionaires who populated the quiet village of Overstrand on the north Norfolk coast at the beginning of the twentieth century. He commissioned the prestigious architect Sir Arthur Blomfield to design Sea Marge (meaning “on the margin of the sea”) and incorporated the neighbouring property, The Gables, after the death of its owner. The year the house was completed, 1902, Edgar Speyer married the American violinist, Leonora von Stosch (1872-1956), for whom he provided Stradivarius and Guarneri violins. Speyer became a baronet in 1906 and a Privy Councillor in 1909. Sir Edgar and Lady Speyer became victims of intense anti-German prejudice during the First World War, such that Speyer offered to resign from the Privy Council and revoke his baronetcy, offers that were summarily rejected by King George V and the Prime Minister, Herbert Asquith. Accusations ranged from serious charges of trading with the enemy to suggestions that he was using Sea Marge as a base from which to signal to German submarines. Post-war in camera investigations into Speyer’s wartime conduct, however, concluded that through his international trading operations he had practically collaborated with the Germans. Sir Edgar and Lady Speyer’s and their daughters’ British nationality was revoked: he was removed from the Privy Council, though allowed to retain his hereditary baronetcy. He sold up all his British business interests and his London house, and moved to New York. There is a biography examining the case against Sir Edgar: Antony Lentin, Banker, Traitor, Scapegoat, Spy? : the troublesome case of Sir Edgar Speyer (Haus 2013). Sea Marge remained in the Speyers’ hands until Sir Edgar’s death in 1932. The purchasers, Mr and Mrs Gibbons, moved into the Coach House, and sold the main house on. It opened as a hotel in 1935: after closing in 1955 the property was for long neglected, but has now been fully restored and once more operates as a hotel: http://www.seamargehotel.co.uk. The 44-page, A4 handbook for the 2011 Norfolk’s Seaside Heritage tour, with text, photographs, maps and a reading list, is available for purchase, price £15.00 including postage and packing. To view sample pages click here. Please send a cheque, payable to Mike Higginbottom, to 63 Vivian Road, Sheffield, S5 6WJ. This entry was posted in Black-and-white architecture ancient and modern, Life-enhancing experiences, Victorian Architecture on January 26, 2014 by Mike Higginbottom. Just outside Beverley’s North Bar stands a riotously decorated black-and-white revival house 4-6 North Bar Without, loaded with dormers and turrets, statues, mottoes and coats of arms, and two endearing carved caricatures of Gladstone and Disraeli, dating c1890. This is the work of the Beverley carver James Edward Elwell, whose fine carvings can be found in churches, public buildings and houses across the East Riding. In Beverley he executed, among much else, Sir George Gilbert Scott’s Gothic organ screen in the Minster (1878-80) and John Oldrid Scott’s reredos at St Mary’s Parish Church (1880-1). He also provided carvings at his own house at 43 North Bar Without (Oak House) (Smith & Brodrick 1880) and the house next door, 45 North Bar Without, which he designed himself (1894). He died in 1926 aged ninety: his work, much of it for the architects Temple Moore and F S Brodrick, dates from the 1880s to around 1910. His son was Frederick William Elwell (1870-1958), a painter with a national reputation who chose to live most of his life in Beverley with his artist wife Mary Dawson, née Bishop, (1874-1952). His portrait-subjects included King George V, whose lying-in-state he also painted, and the Earl and Countess of Strathmore, and he painted numerous civic leaders in Hull and the East Riding. He is now most celebrated for his genre-paintings of local life, including several of the kitchen-staff at the Beverley Arms Hotel, such as ‘Preparations’ and ‘Three Maids’ (both c1940-45), which are displayed on weather-proof panels around the streets of Beverley. By this means Beverley is embellished by the talents of both father and son. This entry was posted in Black-and-white architecture ancient and modern, Humber Heritage, Survivals & Revivals: past views of English architecture, Victorian Architecture on January 24, 2014 by Mike Higginbottom. 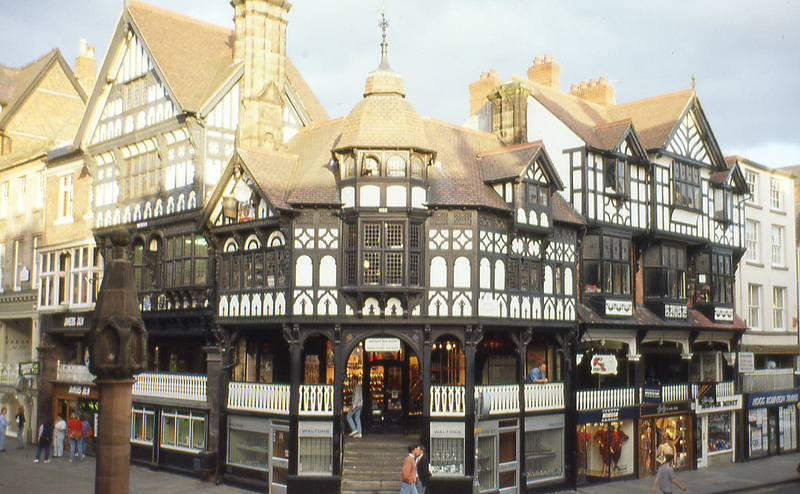 Much of the centre of Chester is a Victorian reconstruction in the black-and-white idiom of the medieval buildings of the famous Rows. It’s odd that the developer, the second Duke of Westminster, and his architect, William Lockwood (1863-???? 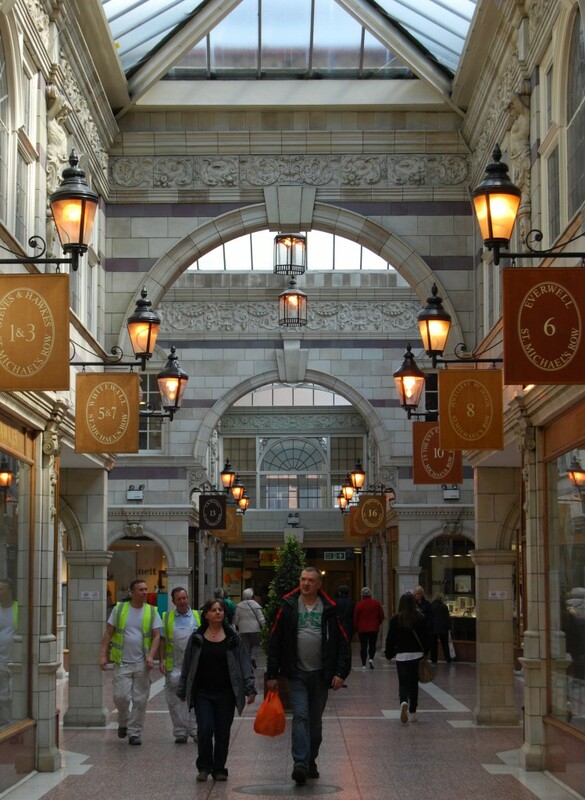 ), the rugby-playing son of Thomas Lockwood (1830-1900) who had built much in the city, should have so badly miscalculated public taste when they faced St Michael’s Row and Arcade (1910) with an elaborate Beaux Arts confection of white and gold Doulton tiles, right in the middle of Bridge Street. There was immediate uproar – from the local press, the City Council and the Bishop. Within a year, His Grace agreed to demolish the frontage and at his own expense, around £4,000, rebuild it from row-level upwards in black-and-white revival style to fit with the streetscape. The original Doulton ware remains within, and it is indeed elegant, but not the right style for the centre of Chester. The Duke’s successors dramatically ignored the lesson when they conceived the gross Grosvenor Precinct in the same block in 1963-5. No amount of tinkering has tempered its ugliness. This entry was posted in Black-and-white architecture ancient and modern, Historic Chester, Survivals & Revivals: past views of English architecture, Victorian Architecture on January 21, 2014 by Mike Higginbottom. Wikipedia has a main-page feature that asks annoying “Did you know?” questions that are so specialised you’re supposed to click on the article to find out something or nothing. Once the question was “Did you know… that Spon Street survived the air raid that obliterated much of Coventry City Centre and is now a Conservation Area?” Well, actually I did, for once. Spon Street is now “Coventry’s hidden treasure” – “a unique selection of quality and niche shops… occupying a range of historic renovated medieval buildings”: http://www.sponstreetcoventry.co.uk. It’s also a conservation tragic-comedy. 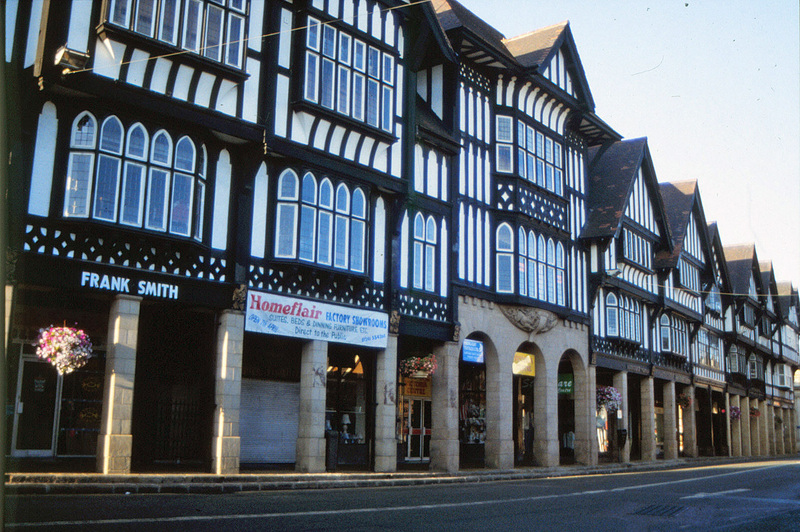 In the early twentieth century Coventry, according to its historian, Mary Dormer Harris, had so much genuine medieval architecture it could have been the “English Nuremburg”; J B Priestley in his English Journey (1934) commented, “you peep round a corner and see half-timbered and gabled houses that would do for the second act of the Meistersinger”. After the Luftwaffe devastated the centre of the city in November 1940, the City Architect, Donald Gibson (1908-1991), set about destroying much of what the Germans left. He grasped the opportunity to give the people of Coventry a splendid new city centre, spacious, clean, modern and new, aligned on an axis with the tower of the bombed Cathedral, with duplex shopping arcades based on – of all things – Chester’s Rows. Meanwhile, a Worcester architect, F W B (Freddie) Charles (1912-2002) took a contrary approach. 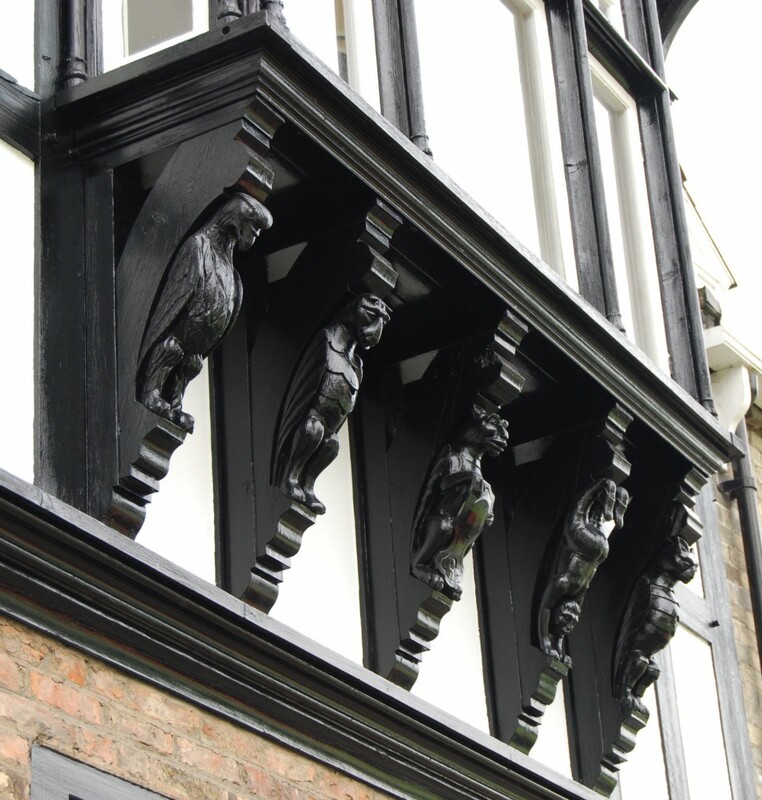 He was the architect of Shrewsbury’s fourteenth- and fifteenth-century Bear Steps and a founder of the Avoncroft Museum of Historic Buildings: http://www.avoncroft.org.uk. 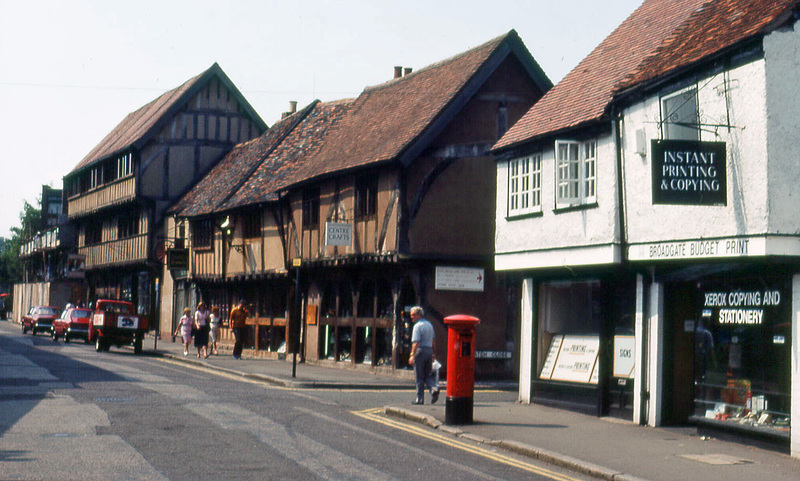 In Coventry he transplanted timber-framed buildings from elsewhere to join surviving structures on Spon Street, a former road into the centre severed by the inner ring-road. 7-10 Much Park Street became 163-4 Spon Street in 1970-4; 142-3 Spon Street was restored on a different-shaped site as 16 Spon Street in 1972-5; the former Green Dragon Inn at 122-123 Much Park Street became 20-21 Spon Street after partial collapse between 1972 and 1982. 159-162 and 167-168 Spon Street were restored in situ, with new “medieval” facades in 1981-5. So it was that some fragments of Coventry’s wealth of medieval buildings that existed in 1900 and survived 1940 were – literally – sent to Coventry. This entry was posted in Black-and-white architecture ancient and modern, Survivals & Revivals: past views of English architecture on January 10, 2014 by Mike Higginbottom. Chesterfield is mainly famous for the Crooked Spire of its medieval parish church. Indeed, the borough motto is “Aspire”. Its town-centre buildings would be unremarkable but for the work of the Borough Surveyor from c1904 to 1933, Major Vincent Smith. He included in the Bill that became the Chesterfield Corporation Act of 1923 a provision for altering the building-lines in order to arcade the new shopping-streets. This provided shelter for pedestrians and additional first-floor space for the buildings’ owners. While admitting that members of Chesterfield Corporation had visited Chester, he flatly denied that his project meant to imitate Chester’s Rows. He claimed the precedent of the eighteenth-century buildings on Chesterfield Market Place. In fact, the closest similarity between Chesterfield’s 1920s shops and the black-and-white buildings of Chester is John Douglas’ Shoemakers’ Row of 1897. So it is that Chesterfield visually resembles its near-namesake Chester, not because of Chester’s unique Rows, but of a link with a late-nineteenth century architect who was himself adapting the idea of the Rows to modern needs. This entry was posted in Black-and-white architecture ancient and modern, Survivals & Revivals: past views of English architecture on January 6, 2014 by Mike Higginbottom. 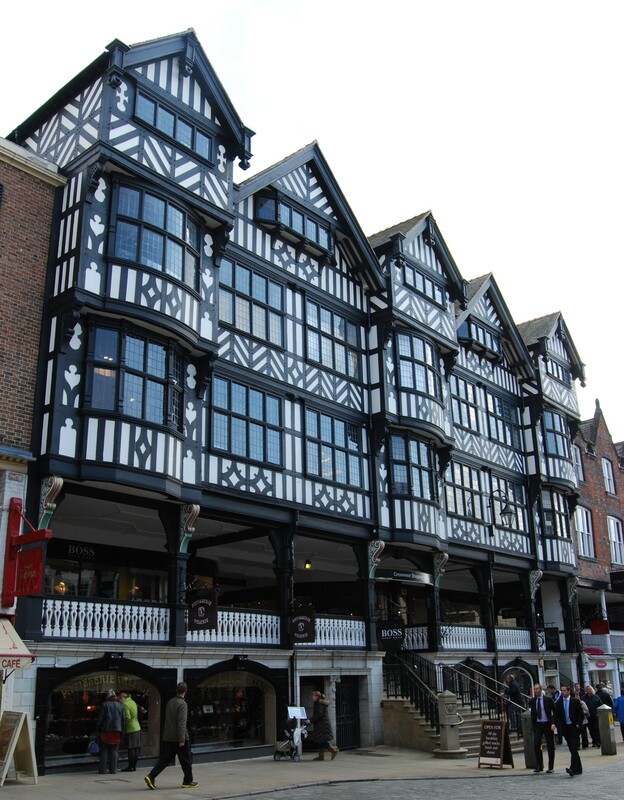 The city of Chester is celebrated for its black-and-white architecture, particularly the distinctive Rows, a system of split-level street frontages along the four main streets, apparently created in the thirteenth century on the remaining rubble of the Roman city of Deva. 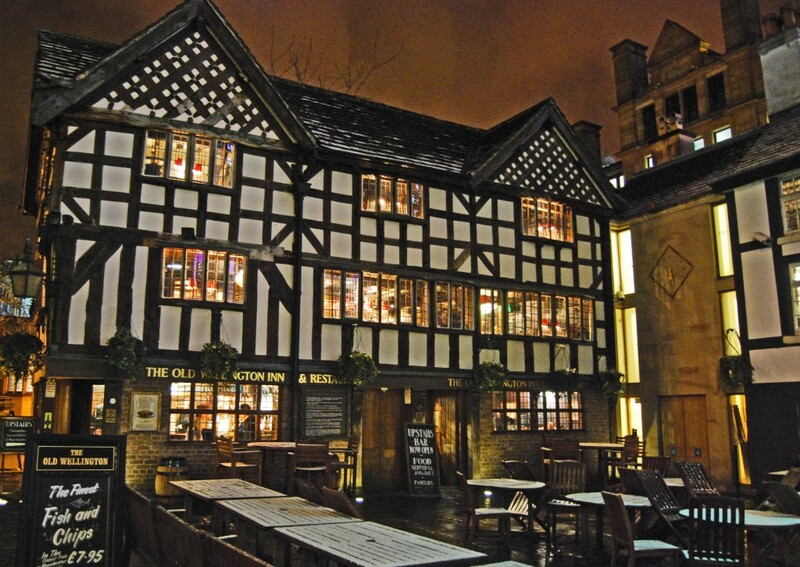 The Rows buildings contain visible remains of medieval and older structures, making shopping a distinctive experience. In fact much of the black-and-white architecture is Victorian or later. As far back as the 1850s, writers in the early volumes of the Chester Archaeological Society Journal drew attention to “the rich and lively façades, the curiously carved fantastical gables, which distinguished the brief but gay rule of the Stuarts” and campaigned vigorously for their restoration. So, when buildings such as Bishop Lloyd’s House (1615), God’s Providence House (1652) and the Leche House (late-17th century) reached the point of physical collapse, their timbers were retained and incorporated in the rebuilding. It was ever thus. The magnificent classical brick façade of the Booth Mansion (1700) on Watergate Street conceals considerable remains of two timber-framed medieval houses dating back to c1260-80. A succession of local architects, beginning with Thomas Mainwaring Penson (1818-1864) and his pupil, Thomas M Lockwood (1830-1900) and dominated by John Douglas (1830-1911) and his pupils, Edward A L Ould (1852-1909) and Charles Howard Minshull (1858-1934), created modern Chester, which superficially looks like ancient Chester could have done. The buildings which celebrated Chester on the Royal Mail 7-pence stamps for European Architectural Heritage Year in 1975 at The Cross were in fact by T M Lockwood dating from 1888 and 1892. John Douglas in particular built much in the same style from scratch. His Shoemakers’ Row on Northgate Street was begun in 1897. It is beautifully detailed, with an unusually proportioned figure of Edward VII that could pass for George V.
This process of sensitive preservation continued after the Second World War, focused by Donald W Insall & Associates’ survey of 1968 and energetically monitored by the Chester Civic Trust: http://www.chestercivictrust.org.uk. But we earnestly warn our fellow-citizens, that if Chester is to maintain its far-famed celebrity as one of the “wonder cities” of England,– if the great European and Transatlantic continents are still to contribute their shoals of annual visitors to fill our hotels, and the not too plenteous coffers of our tradesmen, one course only is open to us. We must maintain our ancient landmarks, we must preserve inviolate our city’s rare attractions,– our quaint old Rows, unique and picturesque as they certainly still are, must not be idly sacrificed at Mammon’s reckless shrine! This entry was posted in Black-and-white architecture ancient and modern, Historic Chester, Survivals & Revivals: past views of English architecture, Victorian Architecture on January 6, 2014 by Mike Higginbottom. 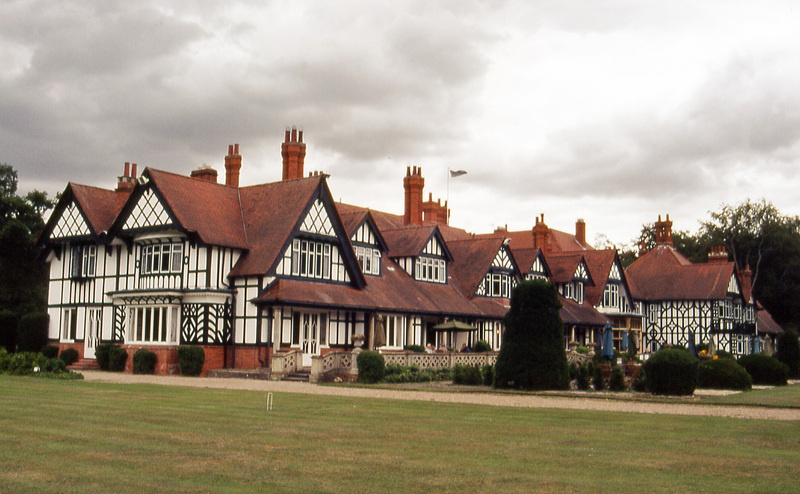 There is no shortage of places to eat and drink in Woodhall Spa – the Dower House Hotel [http://www.dowerhousehotel.co.uk], the Golf Hotel [http://www.thegolf-hotel.com/default.htm] and the Woodhall Spa Hotel (formerly the Eagle Lodge)[http://www.legacy-hotels.co.uk/legacy-woodhall/index.php]. The most historically interesting of them all is the mock-Tudor Petwood [http://www.petwood.co.uk], built by the Baroness Grace Von Eckhardstein, daughter of the furniture-store owner Sir John Blundell Maple in 1905. In 1910, she divorced her German husband and married Captain Archibald Weigall, grandson of the eleventh Earl of Westmorland, who served as land agent for the Earl of Londesborough’s nearby Blankney estate. The following year they commissioned the London architect Frank Peck to extend Petwood, building a staff wing to the east on what the Horncastle News described as “an enormous scale”. Peck’s carefully stylised modifications give this wholly twentieth-century house a “borrowed history”, suggesting a series of additions through the Tudor and Jacobean periods. The main staircase, often attributed to Maples carpenters, is more likely the work of Peck’s foreman-carver James Wylie. At an unknown later date – but probably not much later – the grandiose two-storey oriel-windowed entrance bay was added. Also, mainly during 1913-4, Harold Peto was employed to design the ambitious gardens. In 1933 Petwood became a hotel, and during the Second World War this was the officers’ mess for 617 Squadron, the “Dam Busters”. Now, it’s an exceptionally relaxing place to eat, drink or stay. Indeed, you could spend a very satisfactory weekend staying at any one of the Dower House, the Golf, Petwood or the Woodhall Spa, and wandering off to have coffee, tea or a meal at each of the others. And you could take home a picnic from the Bakery & Delicatessen at 14 Broadway (01526-352183): they’re far too busy selling superb food to bother with a website. The history of Petwood, successively as a house and a hotel, is detailed and illustrated in Edward Mayor, Petwood: the remarkable story of a famous Lincolnshire hotel (Petwood 2000). This entry was posted in Black-and-white architecture ancient and modern, Country Houses, Life-enhancing experiences, Survivals & Revivals: past views of English architecture, Victorian Architecture on January 6, 2014 by Mike Higginbottom.